We’ve been proud to be part of Old Irving Park and have always just called it “home”. Triangle Auto Repair & Service started out as a one-man operation in 1966! The original location was a small triangle piece of property at 3700 W. Irving Park Road. One of the first neighbor’s that came to have his car repaired was “Joe”. Joe lived in the first two flat directly across from 3700 Irving Park Road. As a matter of fact, his in-laws built that two-flat when Irving Park Road was nothing but a dirt road. He had great stories and artifacts from the Civil War passed down from his in-laws. The blizzard of 1967 shut down the entire city. The only traffic on Irving Park Road was a cross country skier! Can you imagine that! Our neighbor today is Mr. Kustom. Before they moved in my original neighbor was John McDonald a Millwright and before them it was a lumber yard going back to the 1920s. We celebrated the Bicentennial, in 1976, by purchasing our second property at 4060 N. Elston – today this is our auto repair facility. During the blizzard of 1979, we used the Northwest (Kennedy) Expressway from our home on the Northwest Side – on snowmobiles! This was the only way we could get around the city. It was completely shut down. We were able to get to Triangle Automotive Service and help dig out our neighbors! We are your Full Service Automotive Repair Shop. We are a full service automotive repair shop. Whether it is a recommended preventative vehicle maintenance, major to minor repairs or an extended service contract repair, we perform the same complete service offered by most car dealerships. From routine auto maintenance to major repairs, you can trust your car or truck to Triangle Auto Service. We have been proud to be part of Old Irving Park we have always just called it “home”. One of our reasons for staying all these years is the small town feel of the neighborhood. “The small town in the big city”. We have always felt that our commitment to excellence came from pride in the neighborhood. For 2015 we hope that the neighborhood feel continues. I’ve been here since 1966 & today my son has taken over the primary responsibilities of the business but, if you’d like to hear more stories – stop in and visit. Maybe, just maybe, you can get your car repaired, too! Triangle Auto Repair started out as a one-man operation in 1966! The original location was a small triangle piece of property at 3700 Irving Park Road. 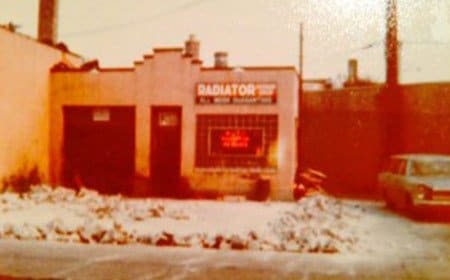 We celebrated the Bicentennial, in 1976, by purchasing our second property at 4060 N. Elston Ave – today this is our auto repair facility. I’ve been here since 1966 & today my son has taken over the primary responsibilities of the business but, if you’d like to hear more stories – stop in and visit.